TMJ (temporomandibular joint) disorder is a dental problem that affects the joints connecting to the jawbone to the skull. The joints may become inflamed or damaged, resulting in popping sounds or pain when the jaw is moved. Though TMJ disorder is not life-threatening, the pain may radiate up the skull and cause headaches. These can range from mild tension headaches to intense migraines. If you struggle with consistent headaches, call Sleep Apnea and TMJ Solutions today! Patients often spend an exorbitant amount of time and money on headache treatments that don’t work, or only mask their symptoms. Many never even consider that the problem might be stemming from their jaw, not their head! Pressure from damaged jaw joints can spread up to the head and eye sockets and down through the neck, shoulders, and back. This can be extremely uncomfortable for patients. Count on Dr. Poss at Sleep Apnea and TMJ Solutions to relax your jaw and clear away your headaches once and for all! There are a few different options for treatment, and it may take a combination of methods to treat your TMJ. You can learn more about our headache treatment options by scheduling an appointment with Sleep Apnea and TMJ Solutions today in Brentwood, TN. 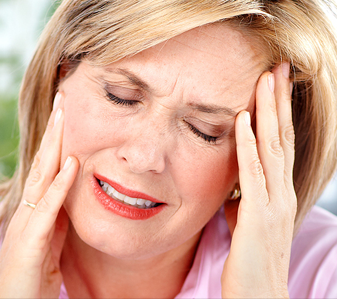 Don’t let jaw pain and headaches keep you down! Talk with Dr. Poss about a personalized treatment plan. We’ve helped patients all around Nashville and Franklin, TN get headache relief and we look forward to helping you!